The Amish Greenwich Low Dresser is completely handcrafted and features full extension side mounted slides on it's six drawers for your convenience. The beveled glass mirror gives the Greenwich High Dresser a well finished look that says attention was given to every detail. 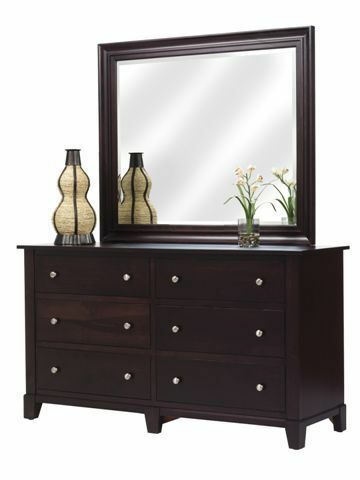 This dresser was designed with a modern look for a contemporary bedroom. The Greenwich Low Dresser is sure to enhance your bedrooms prowess. Even the mirror frame contains a stunning elegance and attention to detail! Each piece of furniture from Miller bedroom furniture is signed and date by the highly skilled Amish woodworker who handcrafted it. Rest assure our Amish craftsmen put their full heart into every piece they put out. Expect Quality!